With a stay at Diamond Palace Apartments in East Mani, you'll be on the beach, just a 1-minute walk from Mavrovouni Beach and 10 minutes by foot from Mavrovouni Beach. Featured amenities include a business center, express check-in, and express check-out. Free self parking is available onsite. With a stay at To Kamari in Skiros, you'll be on the beach and close to Brooke Square and Manos Faltaits Museum. The front desk is staffed during limited hours. Free self parking is available onsite. 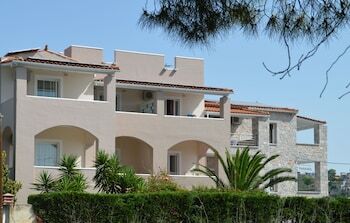 Located in Zakynthos (Elation), Climati Studios is close to Makris Gialos Beach and Xigia Beach. Free self parking is available onsite. With a stay at Coral Hotel in Faistos, you'll be minutes from Caves of Matala and Beach of Matala. The front desk is staffed during limited hours. Free self parking is available onsite. With a stay at this apartment in Santorini, you'll be a 4-minute drive from Archaeological Museum and 6 minutes from Museum of Prehistoric Thira. Located in Santorini, Villa Amalia is a 4-minute drive from Domaine Sigalas and 7 minutes from Baxedes Beach. A roundtrip airport shuttle is provided for a surcharge (available 24 hours).